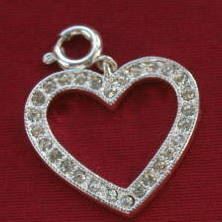 This Silver and Crystal Dog Charm has a large silver heart that is cut out in the center. There are approximately 28 crystal rhinestones adorning the Silver and Crystal Dog Charm which measures 1 1/4 inches from the clasp to the bottom of the hearnd and 2 inches wide. The clasp at the top will attach the charm to your pets collar or necklace.